Just as we were starting to relax around here with our Mint Juleps, one of our intrepid Madtini interns found this drink recipe on the Interwebs. Seems the gang over at Cocktail Times had posted a delicious looking drink recipe dubbed the Gran Derby, and since it appeared we had just enough Grand Marnier left in inventory, we felt we could substitute that for the GranGala listed in the recipe. Still two hours to post time for the Derby… cheers! Moisten the rim of the martini glass with a lice of lemon. Dip the rim in a small plate covered in superfine sugar to create a frosted rim. 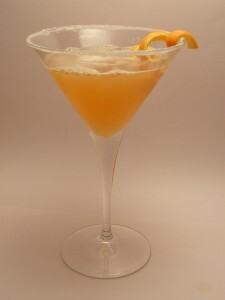 Combine the bourbon, grand marnier, lemon and orange juice in a cocktail shaker filled with ice. Shake vigorously and strain into a cocktail glass.